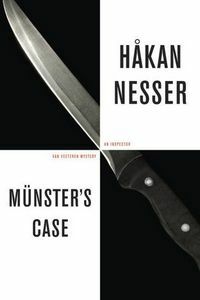 Münster's Case by Håkan Nesser: Synopsis and Online Purchase Options. Synopsis (from the publisher): For Waldemar Leverkuhn the day could not have begun more auspiciously. He and three of his friends, all retirees, have just won the lottery. It's a modest sum when split four ways—certainly not enough to lift Waldemar out of the plain apartment he shares with his quiet, weary wife — but it's enough for the old men to toast their good luck with a blowout at their favorite bar. The celebration ends, however, with Waldemar drunk, stumbling, belligerent, and eventually dead in his own bed, stabbed twenty-eight times in the chest with a carving knife. Taking charge of the case is Intendent Münster, Chief Inspector Van Veeteren's longtime right-hand man, and his beguiling colleague Ewa Moreno. They seem to have a surefire lead with the disappearance of one of Waldemar's friends on the same night as the murder, but after a cursory look into his whereabouts produces more questions than answers, the investigation suddenly seems to solve itself when Marie-Louise Leverkuhn, Waldemar's wife, confesses to the crime and calmly resigns herself to her fate. The case is, but all accounts, closed. That is, until one of the Leverkuhns' neighbors in the same unassuming block of apartments goes missing and turns up — spectacularly, gruesomely — in pieces around the city.